On Saturday(November 17th) the 2018 Soul Train Awards took place at the Orleans Arena in Las Vegas, Nevada. Erykah Badu who was on hand as a performer & honoree, wore an interesting piece courtesy of RICK OWENS. Her SPRING 2019 piece featured a geometric cutout cape & dress and metal headpiece. The only other person that can do this is Lady Gaga but Erykah owns it. Normani stepped out in a RAISA & VANESSA FALL 2018 black ruffle mini dress. This dress is really cute and short but the fit on the bust is unflattering. Justine Skye wore a EACH X OTHER FALL 2018 grey two-piece suit with contrasting white & lavender fringe panels. DAVID YURMAN jewelry and JIMMY CHOO pumps finished up her look. 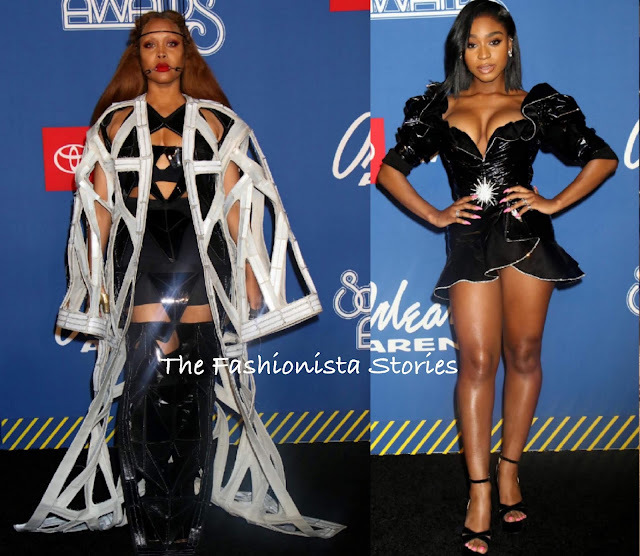 Bresha Webb wore a EMILIO PUCCI long sleeve red floor length dress, featuring a lace-up side front panel and a split. Instead of wearing ankle strap sandals, she opted for metallic CHRISTIAN LOUBOUTIN pumps.